Southern South American Proteaceae can occupy soils that are rich in total phosphorus (P) but poor in available P (for example volcanic soils) thanks to their cluster roots (CR), which mine soil P. However, some southern South American Proteaceae occur in a wide range of soil nutrition. We hypothesized that CR formation and function are more responsive to nutrient soil availability in the widely-distributed Embothrium coccineum than in the narrowly-distributed Orites myrtoidea, which exclusively occurs in recent volcanic depositions. Survival, growth rate, CR formation (number, biomass) and function (carboxylate exudation, phosphatase activity) were evaluated in seedlings of both species after five months of growth in either a volcanic or organic substrate. E. coccineum exhibited full survival in both substrates, but had significantly lower growth, higher CR formation, higher CR citrate and malate exudation, and higher phosphatase activity in the volcanic substrate. By contrast, O. myrtoidea had similar growth rate in both substrates but 73% lower survival and null CR formation in the organic compared to the volcanic substrate. 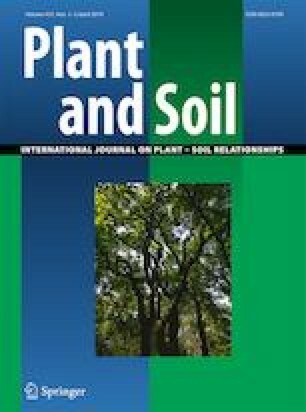 Variation in soil nutrient availability caused variation in growth and CR formation and function in a southern South American Proteaceae species of wider distribution, but not in a narrowly-distributed counterpart. Responsible Editor: N. Jim Barrow. Financial support was provided by the Fondo Nacional de Desarrollo Científico y Tecnológico de Chile (Fondecyt) 1130440 and 1180699 regular grants. Greenhouse facilities were provided by the Instituto de Ciencias Ambientales y Evolutivas, Universidad Austral de Chile. We thank Dr. Mauricio Rondanelli and Dr. Cristián Echeverría for seed collection of O. myrtoidea, Dr. Peter Seemann for his help with the germination of O. myrtoidea seeds, and Corporación Nacional Forestal (CONAF) for the permits to visit and collect seeds in natural protected areas. Also, we thank Caroline Dallstream and Emily Giles for English corrections. We would like to aknowledge to Dr. Jim barrow for your helpful comments and two anonimous referees.